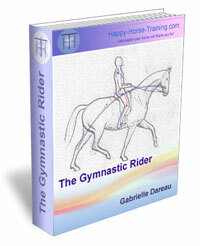 Loading a horse can easily become a stressful experience for everyone involved when the horse is not happy to go in. The usual way people respond to this reluctance is by pressuring them in various ways, and by showing them there is no other alternative. It is possible to resolve this kind of situation in a very different way however, one that uses trust and relaxation instead of tension and intimidation. 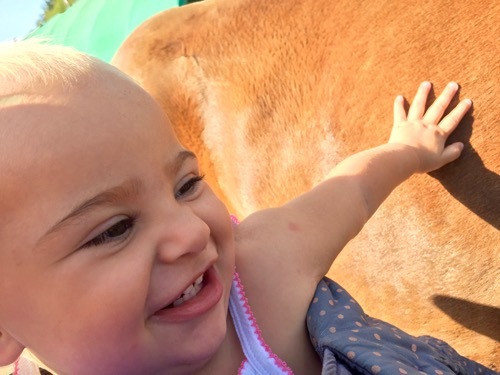 My baby girl Licia was coming up to her first birthday earlier this summer and I thought it was high time she had her first pony! Actually we were just having a look at ponies in the small ads for fun ;) but when Xavier came across Flicka I instantly had that ‘mean to be’ feeling about her. Flicka is only two years old, and not the smallest pony in the world, so it didn’t seem a very logical choice for a first pony, but when I thought it through these factors were perfect: her young age meant that she would grow up in a holistic environment, never knowing the damaging effects of such things as stables, shoes and pharmaceutical products. In addition, I would be able to bring her on from the start with correct gymnastic training when she’s good and ready, instead of having to undo someone else's mistakes. She will be ready for gentle riding just when Licia is old enough to start, if she wants to of course (current indications are looking very positive in that regard!). Her size means that she will not be too small for me to ride and establish her training properly. 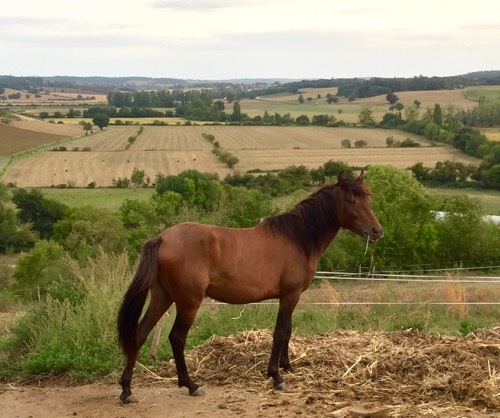 She has a very strong back thanks to her Lusitano mother and Arab/Camargue lines on her father’s side, and beautiful hind-leg conformation! We went to see her and I was won over by her sweet, calm and confident nature. She was very well handled and already living in a herd situation. We agreed to take her, and arranged to come back for her in a few weeks time, once she had been separated from her mother who she was still living with. She was already fully weaned, but I didn't want any association of leaving her mother with the journey, or the additional stress that would cause. I arranged to borrow a trailer from a friend who would help me load her as Xavier was away with work. When we took Flicka out of the field where she’d been living with her friends and set about loading her I had no choice but to take a back seat because Licia had woken up on arrival and I had to carry her, having no one to look after her for me. I knew my friend to be experienced and calm with horses, so I wasn’t too worried about him taking on the job of loading Flicka. I also knew she was very well handled, calm and confident with people. I had no idea how utterly determined she was going to be not to go in the trailer however! My friend did a fairly good job of giving Flicka some time to look at the trailer, and avoided putting too much pressure on her to begin with, but she was extremely reluctant to even approach the ramp, and time went by without us making much progress. It was clear this was not going to be an easy job! We moved the trailer into a handy gap between two barns and blocked the remaining spaces on either side of the trailer with hay bales. It couldn’t have been a better situation for loading a horse, but Flicka was dead-set against going up that ramp. By this stage my friend had requested a whip be used to try to push through Flicka’s defenses. Although it was never used very strongly, neither I nor Flicka’s previous owner was happy about this, but carrying a baby and unable to take charge of the situation, I couldn’t propose any alternative. 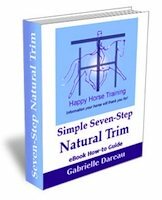 We tried all the tricks in the book - putting lunge lines round her back end, putting one of her friends in the trailer first, placing her front feet on the ramp, etc. But whenever the pressure was increased to a certain level Flicka reared and turned in the air spectacularly, even plunging through the hay bales blocking the sides of the ramp on two occasions. Between these stressful moments she was surprisingly calm. Several times she managed to pull away, but she didn’t run back to her friends, instead allowing us to catch her again easily. Another thing that impressed me about her character was that not one time did she kick out at anyone, despite the pressure being put on her. After almost three hours, Flicka had put no more than her front feet on the ramp, and we had to call it a day. My friend said she was one of the very few horses he had not managed to load. Neither he nor her owner were at all convinced that it would be possible to get her in on another occasion, but I still had a good feeling about her, so I decided to wait and try again in a few weeks time. Second Time Round: Doing It My Way! Once Xavier was back from work and able to help me, we hired a small lorry and came back to get Flicka. This time I was able to take her myself. Her owner was happy to sit back and watch, and Xavier took care of Licia. The first thing that was obvious to me when we took her out of the field with her friends was that she needed to be given as much time as possible to calm down and accept the situation before trying to take her anywhere near the lorry. This took some time, as she was very stressed with her friends calling to her from the adjacent field, but eventually she settled and started to be able to bring her awareness to me. I noticed she would lead fine to a certain extent, but when it was a question of her going in a direction she wasn’t happy with she planted, raised her head, and wouldn’t give an inch to any pressure in the lead rope. Instead of trying to push her through this refusal (this is something that will be resolved in time with future leading work) I started to do some contact yielding, asking her to shift her body sideways when I pressed against the back of her ribcage. I did this in the same way I would ask for lateral work in-hand, and she yielded surprisingly easily - she is going to make a super dressage pony! When she gave like this I stopped and scratched her mane a lot, all the time giving her as much physical contact as possible. She soon started to really soften and relax, and even started showing me affection - resting her head on my shoulder and nibbling me gently. She still resisted being lead towards the ramp, but I worked her into the passageway we had created leading up to the ramp by yielding her either sideways, circling round, or backwards, always giving her lots of time in between steps forward. I got her up to the foot of the ramp in this way, and I then had to go and feed Licia who had woken up in the meantime. I gave Flicka to her owner and she was happy to stay standing at the ramp, but her owner later told me that she didn't take her eyes off me while I was taking care of Licia - I had already made a meaningful connection with her. When I took Flicka back again, I did some more yielding work, circling her in front of the ramp, and then when she was stood at the bottom of the ramp I sensed a real desire in her to do what I was asking her. I sat down inside the lorry and just waited, with the rope completely slack. This immediately changed her attitude towards the lorry - I could see that it was becoming a possibility in her mind that it could be a safe enough space for her to go into it. With the help of some nuts that I sprinkled on the ramp, she walked up it until all four feet were on the ramp, then her front feet came inside the lorry. It must have looked like we were almost there, but I could sense she hadn’t yet decided to go in. That was as far as we got that time, as I knew I had to let her go back down the ramp again. It must have seemed like back to square one for the patient on-lookers! 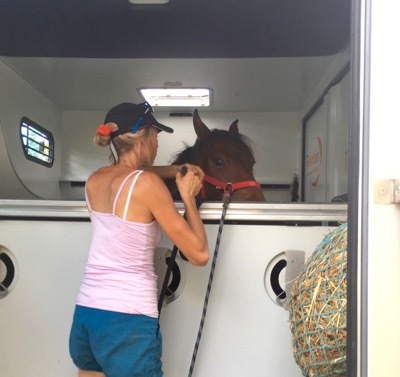 At this stage of proceedings, faced with the reality of going in the van, Flicka was now having periods of just switching off: seemingly relaxed and sleepy, resting a back leg, but clearly not with me anymore. In fact this was her dissociating, a sign of horse trauma. 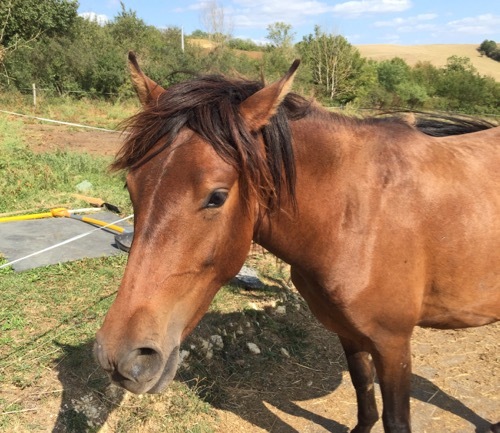 When she was a foal, her owner had rescued her and her mother from a neglect situation, and it had been a fairly long journey from the Mediterranean coast to the Gers. 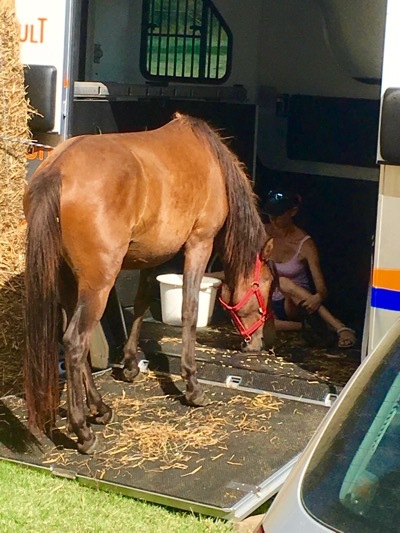 This was undoubtedly traumatic for Flicka, and would explain why now, without the protection of her mother, she was so reluctant to go back in a vehicle. The ideal solution in this situation would have been to work with her slowly with a trailer over several months, but this was simply not possible for me given the situation. It was now or never! I knew part of her wanted to go in and come to her new life, and I also knew she was starting to really trust me and see me as a calm and trustworthy leader. I did more yielding work, and then following my intuition I presented her at the ramp, stood at her shoulder and raised my energy as if to say to her positively and affirmatively, right we’re going in now! She came up the ramp with me and almost right into the lorry, then with a little more encouragement she was in! She was quite stressed once inside, but there was no kicking or stamping as we prepared to leave. 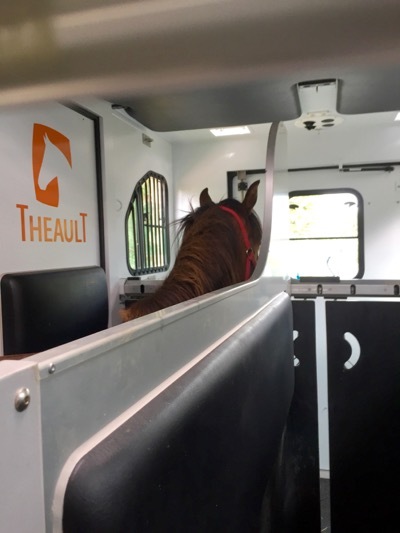 These little French horse vans are wonderfully designed, and we were able to adjust the partition easily to give her lots of support during the journey, which passed uneventfully as we kept an eye on her via the on-board camera! 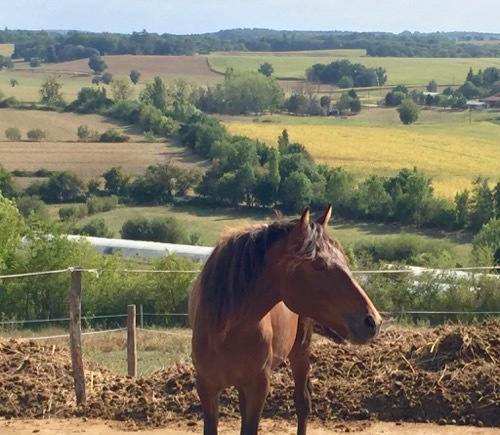 Flicka’s previous owner came to me before we left and said to me, with tears in her eyes, how moved she had been by the gentleness of my approach, and the contrast with the force and tension of the other occasion. 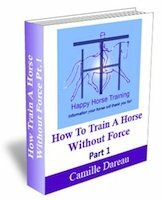 She is a NH enthusiast, used to influencing horses at a distance, and this contact-based approach was completely new to her. I explained that the contact yielding work is incredibly powerful as it releases tension on a deep level through the relaxation of the diaphragm. 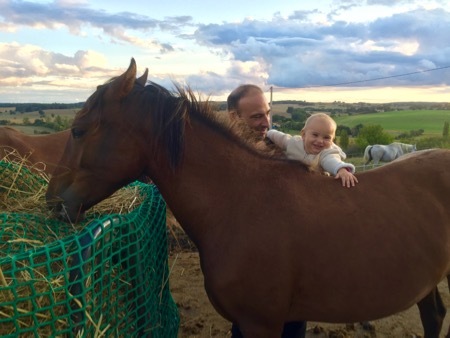 It creates a trust-based connection with horses that gives them a genuine respect for you, one that has nothing to do with dominance and intimidation. Thinking back on the two sessions, it’s true that they couldn’t have been more different. The first time we were ‘getting on with it’ , not ‘hanging about’ or wasting time, and yet it seemed we were at it forever. Everyone was stressed and tired, Flicka had almost injured herself several times, and at the end of it all, with four people involved trying every possible means, we still didn’t get her in! Although we hadn't really forced through her boundaries, the experience certainly hadn't increased her trust in humans. The second time no one touched Flicka but me, and there was no whip (or rope-twirling) involved at all, and not one moment of stressful pressure put on her. The only demand I made at all was to simply push her sideways, in the same way that another horse would ask her to move out of the way. Although it took me almost as long this way, it didn’t seem like a long ordeal at all because we were staying in the moment. And above all, she actually accepted to go in, not as a way of escaping unpleasant demands, but because she chose to put her faith in me. 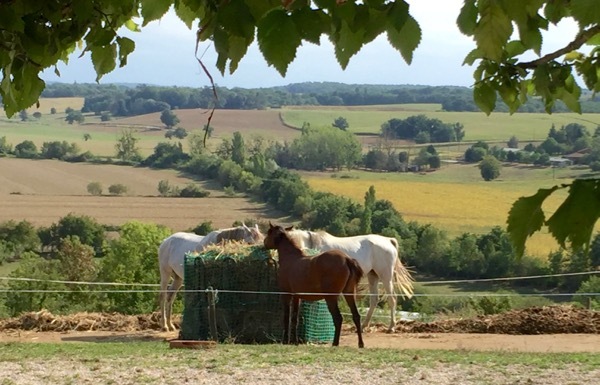 Settling in with the herd at HHT after only a few days - Flicka is already friends with Habanero and Ouhmia, despite her laying down firmly the ground rules to begin with, in typical Arabian style!